Innovation — finding new solutions and building upon existing ideas — is critical to the evolution of a society. Metro Detroit has produced an extraordinary number of innovators — some iconic, some unheralded — who forever changed the way we look at manufacturing, products, processes and services. The Gallery of Innovation presents the process of innovation through the stories of Detroit innovators, with the goal of inspiring and empowering a new generation of problem solvers. The gallery explores Detroit-area innovators and innovations, emphasizing how Detroit has historically been — and will continue to be — a hub for innovation. In particular, it focuses on the process that these inspirational men and women followed in making their dreams a reality. It also helps dispel one of the more common myths surrounding this process. The innovation process is generally divided into 3 stages: inputs, “eureka!” moments, and effects. In each stage, visitors “meet” innovators who serve as examples of that particular step in the process. At the Inputs stage, emphasis is placed on the motivations for innovation, the timing that allowed it to happen, the capital (or lack thereof) that determined the future of the innovation. The “Eureka!” moments section focuses on innovators who fulfilled a specific need, persisting despite failures. Visitors learn that even the best ideas required some patience and planning to succeed. At the Effects stage, visitors learn that innovations are not stand-alone things. Each successful innovator had an impact on Detroit—and sometimes even sparked additional innovations. By exploring innovators through a historical perspective, examining roadblocks to innovations, and looking at new needs that came from innovations, visitors understand that not every innovation solves a problem, and not every innovation has a positive outcome. But, they also understand that many innovations changed the way Detroiters lived and worked. 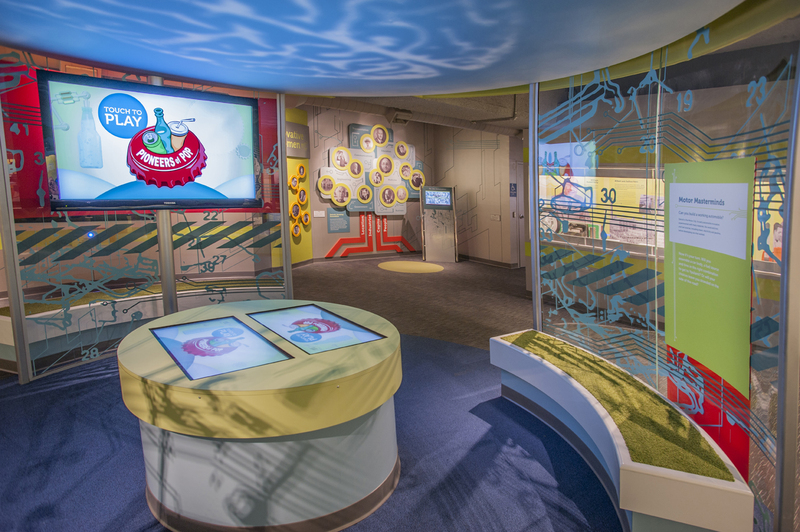 The gallery features an Innovation Station, which allows visitors to take lessons learned from other Detroit innovators and try the process themselves. At the center of the gallery, visitors are able to create and test different innovations. For example, visitors can create their own distinct soft drink flavor and try them out with virtual "taste testers." A touch-screen kiosk contains a database with nearly 100 Detroit area innovators in medicine, education, community service, business, government, media and more. Try the Innovation Station games online!